This year came and went so quickly and in the 365 days my tastebuds and stomach were treated to some mighty delicious fare (and some not so good). As a tribute to 2011, here is a list of my 10 favorites of the year. These are places I will (and have) return to over and over again. 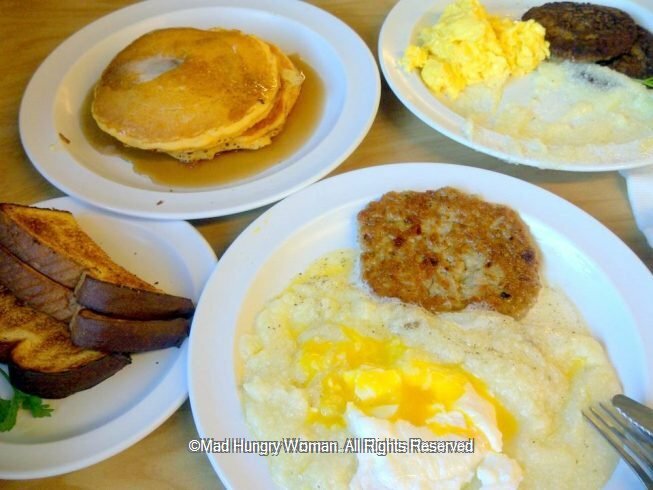 I’m not a big breakfast fan but The Serving Spoon has won me over with their home-style comfort food. Whenever I am up in LA, I always make sure I stop by and get myself some poached eggs and grits — yes, GRITS is a MUST! 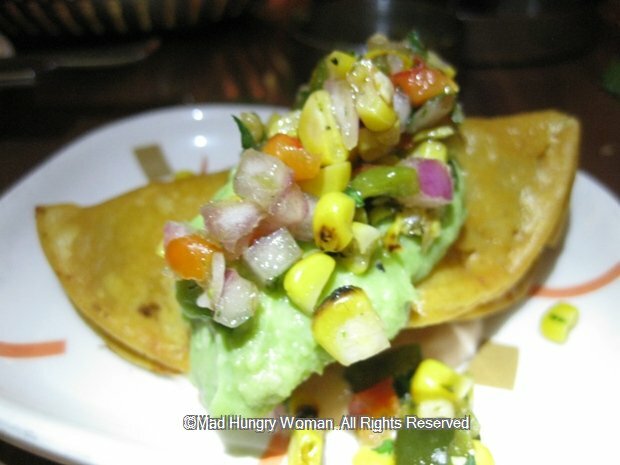 One of the most addictive things this year has been Soho Taco. 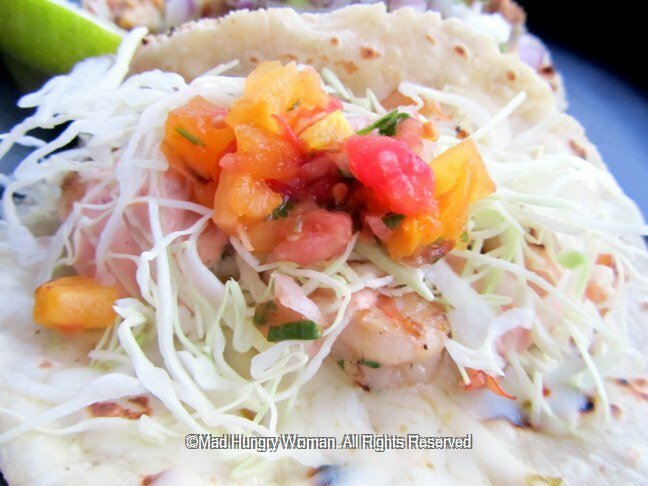 Lucky for us they launched their gourmet food truck a few months ago and now everyone can enjoy these delicious tacos! A few drinks and a couple of small plates does it for me at Chef Ryan Adam’s 370 Common in Laguna Beach. Renzo Machiavello is what makes Renzo’s A Taste of Peru what it is. The food comes straight from his heart and soul and nothing is fried, making it a healthy alternative you can enjoy over and over again. The second breakfast place I want to give a shout out to is Anepalco’s Cafe. 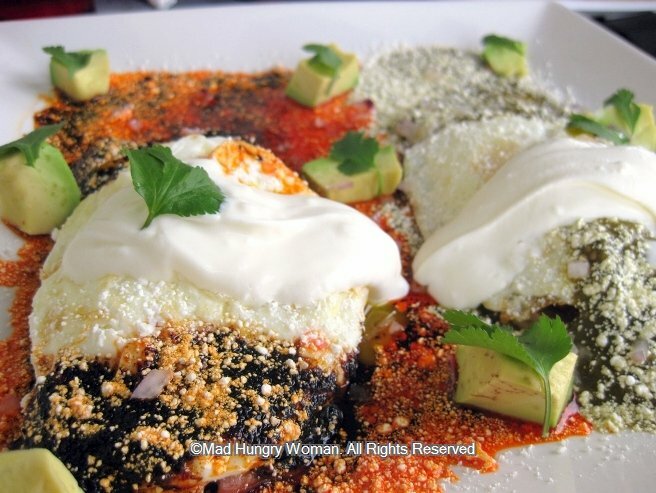 Chef Danny’s chilaquiles and huevos divorciados are both to-die-for! I love Rooster PM where the atmosphere is chill and the service friendly. 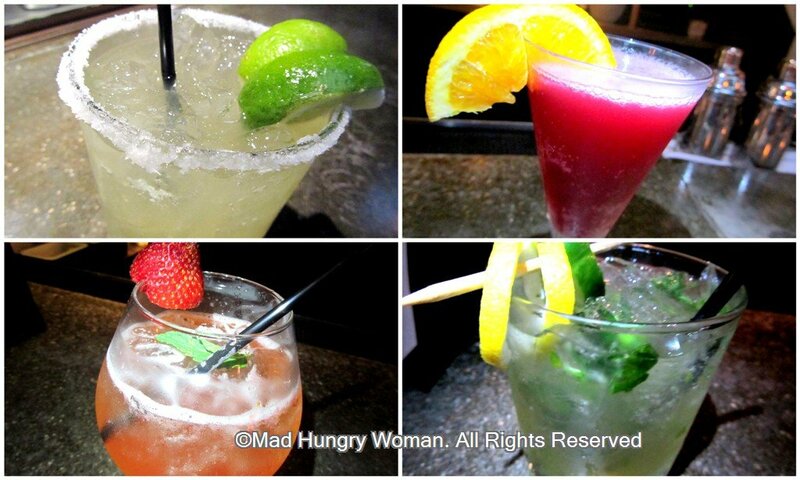 Grab a glass of tinto, or two, — or four in my case — and some grub and relax with a few friends after work. 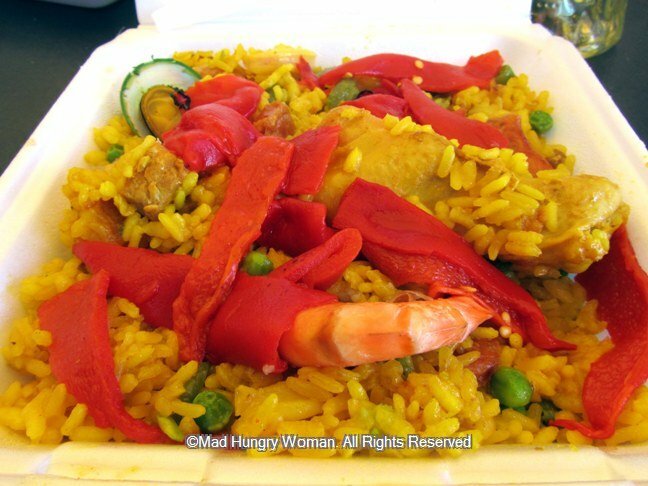 If you want paella, then go to La Espanola, but they only serve it on Saturdays and you have to call them ahead of time to order it. I suggest getting together a group of friends, buy a bottle of wine from the market, sit back with your paella and some Spanish red, repeat! 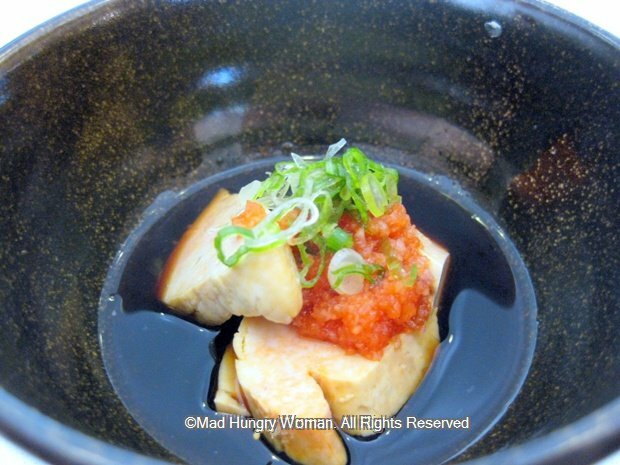 One of the most surprising finds this year was Sushi Noguchi where a husband and wife team, Hiro and Jun Noguchi offers some of the freshest and most delicious sushi and sashimi in Orange County. Make sure you get the omakase! MB Post has received some hype since it opened this year and deservedly so! 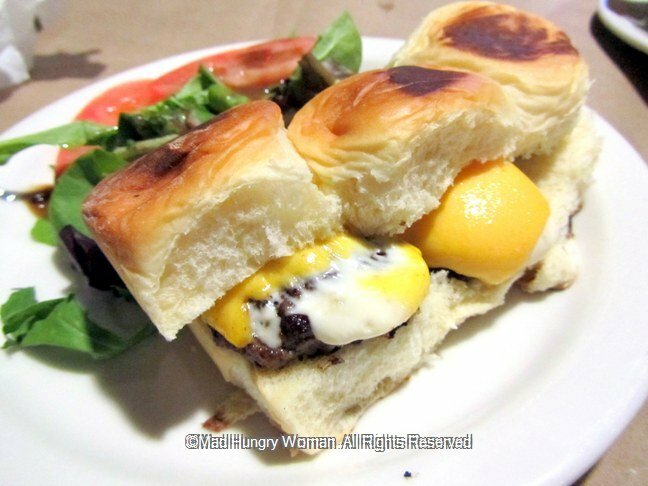 The food is stellar and it is comfort food done small and done right. This way you can indulge in more than one portion! 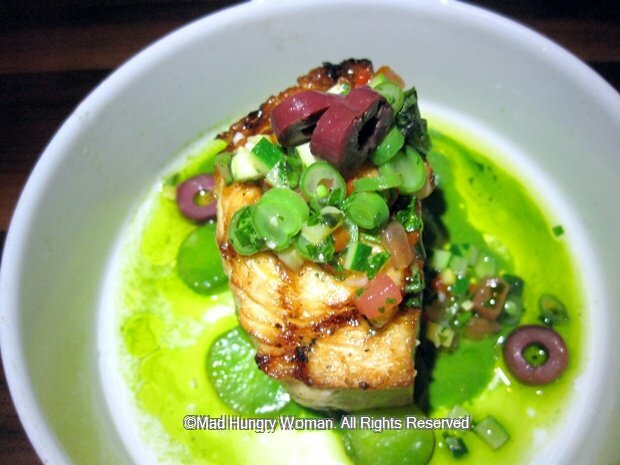 And the treat of the year was Addison where Chef William Bradley’s creativity and unique style is all his own. This is one of those places which, if I could afford it, would return to again and again, but sadly, I can’t. A special occasion restaurant you MUST check out! Wishing you all a delicious 2012! Since the Capital Seafood at Irvine Spectrum opened, I’ve been going for dim sum a lot (but that’s another post). This was the first time I came for dinner and it was for a tasting hosted by James Tea via Marian the Foodie. 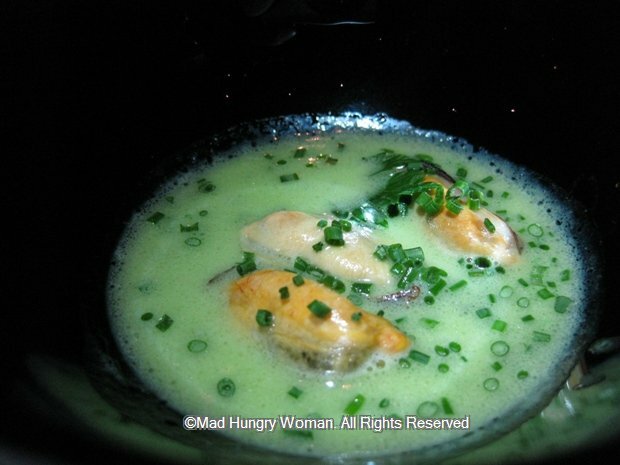 Our 11 course meal began with Whole Winter Melon Soup with Assorted Seafood, which is usually a feature at banquets in Asia. I haven’t had whole winter melon soup in years because I don’t usually go to a Chinese dinner with THAT many people, plus, it is something you have to order ahead of time — generally 24 hours ahead — as it takes time to prepare. 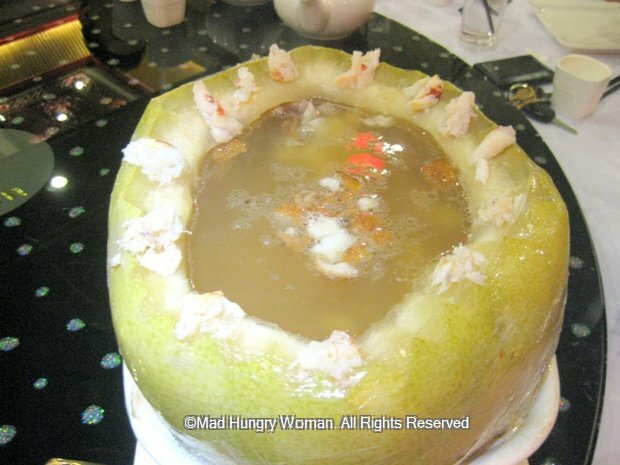 The broth is incredibly flavorful and has shrimp, scallops, squid, crab meat, mushroom and of course, tender, melt-in-the-mouth winter melon scooped from the interior of the whole melon. 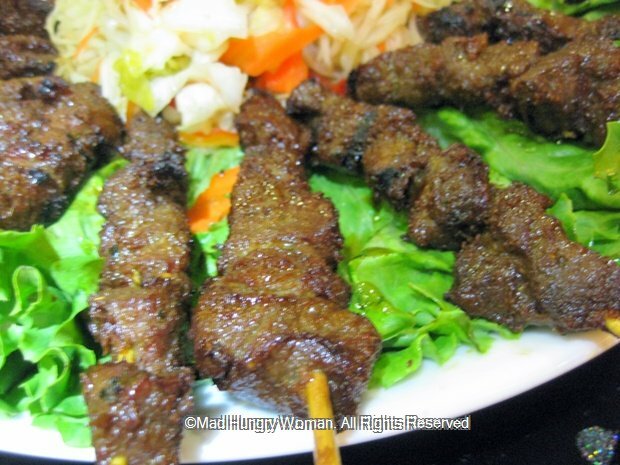 Filet Mignon Satay Skewers are very tasty. 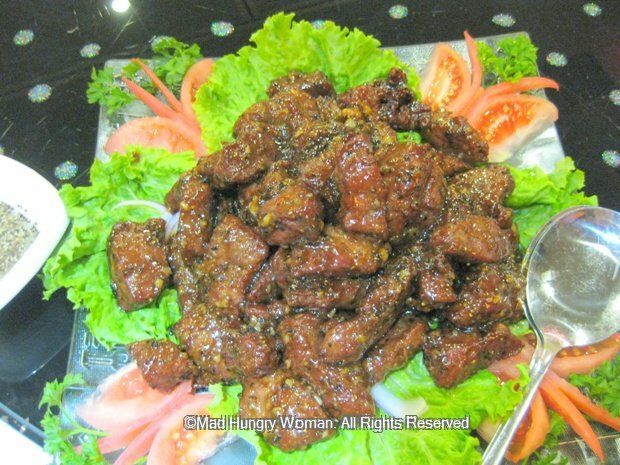 The beef is flavorful, tender and the hints of lemongrass is evident. I think this dish appeals to both kids and adults alike. 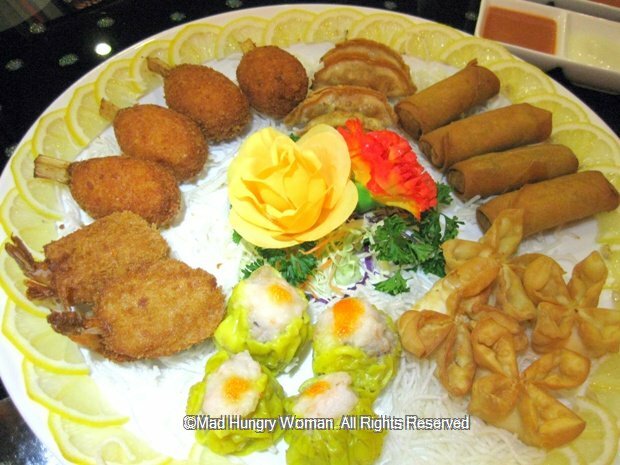 Although dim sum is only served during the day, Capital Seafood has put together an Assorted Dim Sum Platter for those who might want an array of dim sum as appetizers at dinner time. Comprising siu mai, vegetable eggrolls, shrimp w/sugar cane, crab wontons, chicken potstickers and butterfly shrimp, the selection is a good way to start your meal. 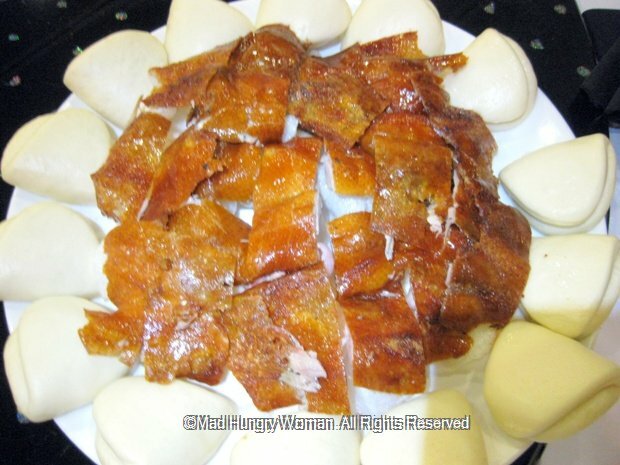 One of the treats of the meal was Roasted Peking Duck. I’ve always loved Peking duck and the one here is pretty good. I wish the bao (bun) was a little less doughy and a little less thick. Served with scallions and hoisin sauce, it is a stellar dish but definitely requires a few people to share. 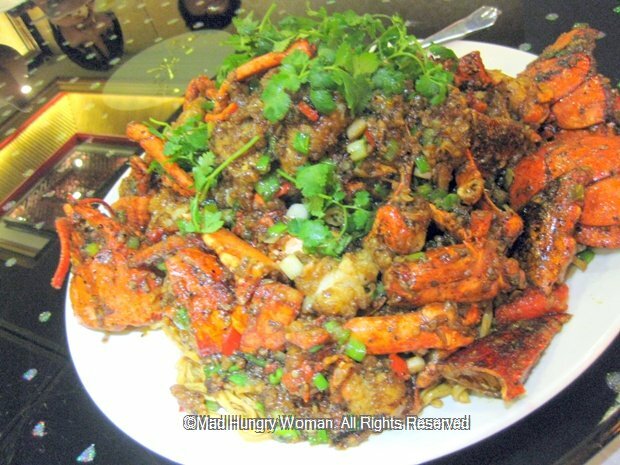 Another delicious item was House Special Lobster w/ E-mein Noodles. The lobster was tender albeit a little greasy and the noodles soaked in all the flavors of the sauce. I’ve ordered this before at the Diamond Jamboree location and have enjoyed it on its own without the noodles. A take on the Vietnamese dish bo luc lac, Capital’s Filet Mignon Cubes is buttery, garlicky and goes well with steamed white rice. In fact, I suggest you get some to eat with this dish! 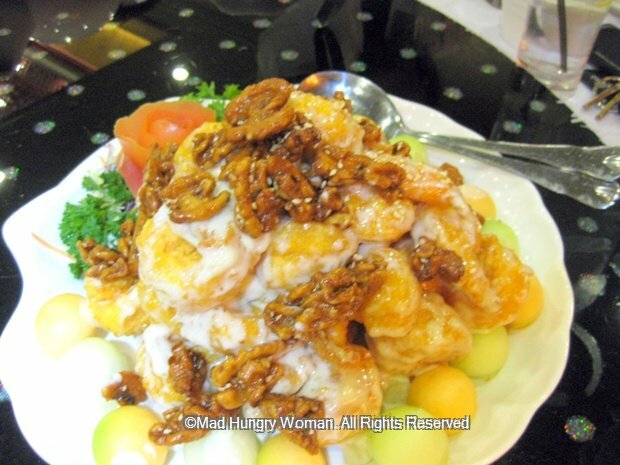 To be quite honest, I really hate Honey Glazed Walnut Shrimps, and that’s a blanket statement. I don’t like it period, but it seems everyone else seems to love it. I just can’t get over mayo, and especially, warm mayo. 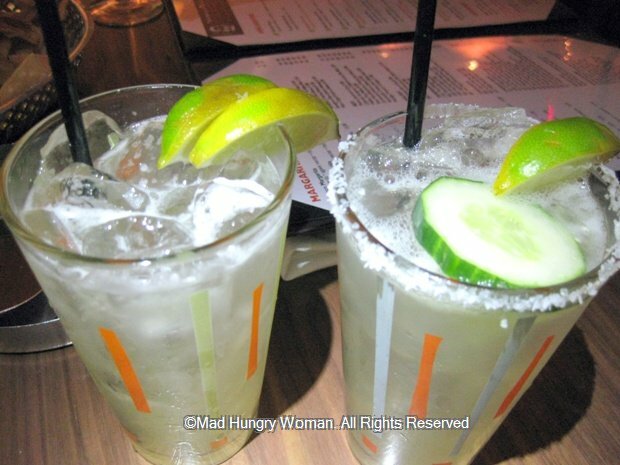 The version here is served with honeydew and cantaloupe melon balls. Love the walnuts though. 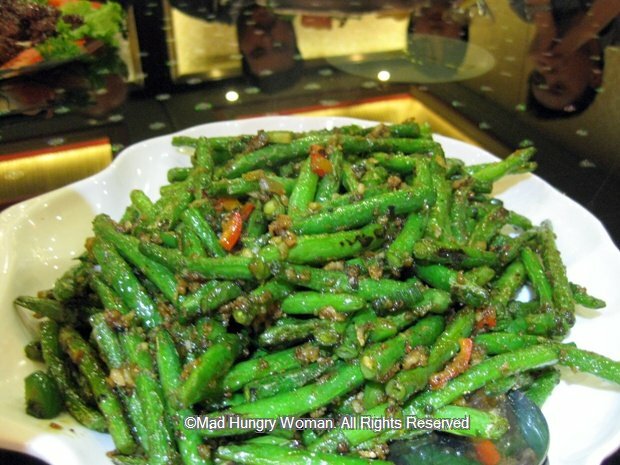 Who doesn’t love string beans, and the House String Beans is really good. It is dry with that slightly shriveled texture with the flavors completely coating the beans. The next dish to hit the table was a HUGE hit. Pan Seared SeaBass is a perfectly seared piece of seabass steak and drizzled with a sweet soy sauce dressing. 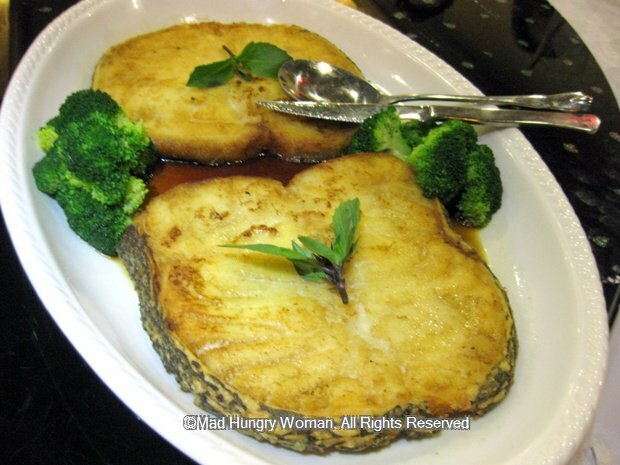 The fish was moist and the sauce just clung to the tender, flaky flesh. As if there wasn’t enough food, Chef’s Fried Rice with shrimp, scallops, squid, crabmeat, eggwhites, dried scallops and Japanese seaweed (nori) was a delicious end to the meal. 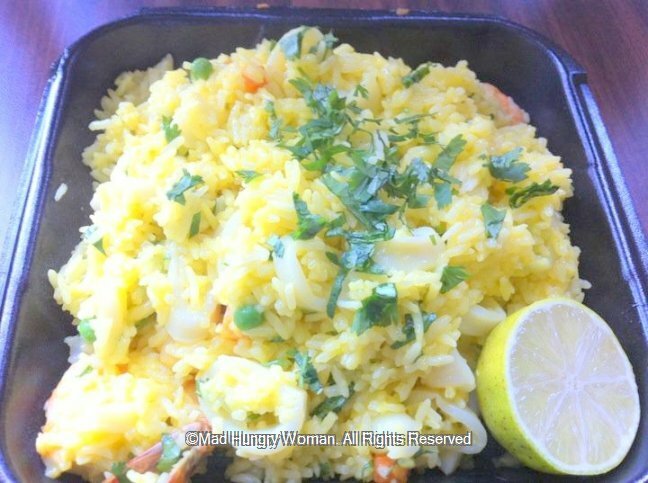 It beats regular Yang Chow fried rice any day. If you have a sweet tooth, Almond Cream Souffle is a good choice. It is an almond ‘tea’ usually served as a sweet soup at the end of the meal. 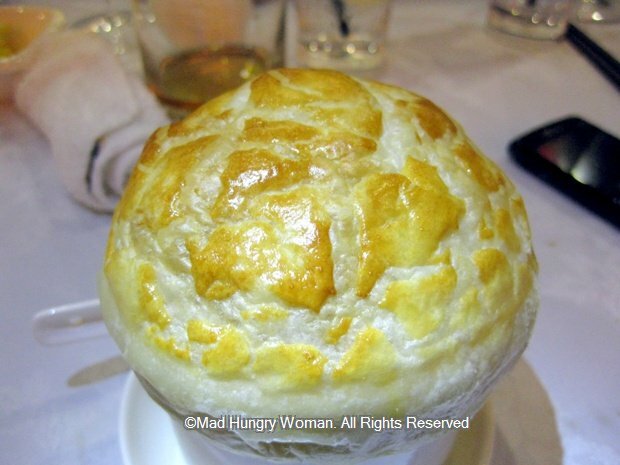 Here, the almond soup is dotted with ginko nuts and diced water chestnuts, a modern way to serve this dessert with a flaky puff pastry covering. Gather a bunch of people together and enjoy a shared meal Chinese style. Capital Seafood has the means to make your experience an authentic and tasty one. This wonderfully chill restaurant is something of an anomaly. On the one hand, you have celebrity chefs at the helm and on the other, it shouldn’t feel as relaxed as it does because of that fact, but it does. I love the easy-going atmosphere where I will feel completely comfortable bringing my son, or even, a group of his friends with me. A basket of very tasty chips arrived with three types of salsa. There was a roasted one, a roja and a verde. 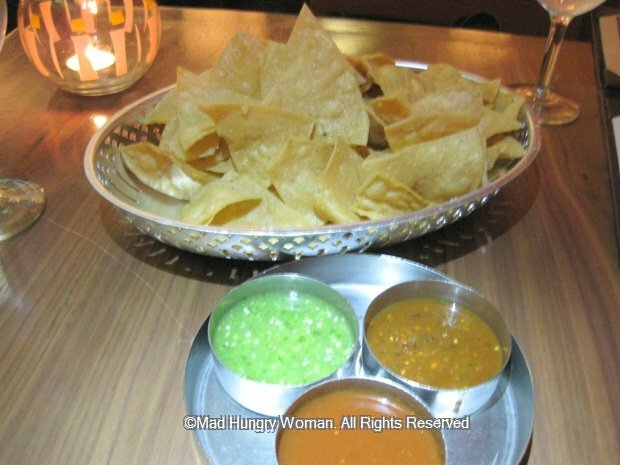 We also asked for a spicier one later on after we’d polished off the first basket and on our second — it’s hard to resist those chips which is why as you continue to read this you’ll realize we never made it to the entrees. We ordered some cocktails — Cucumber + Elder Flower Margarita ($13) which had a slight kick from the serrano chile, and a Caipirinha ($11), a pretty addictive and refreshing cocktail. 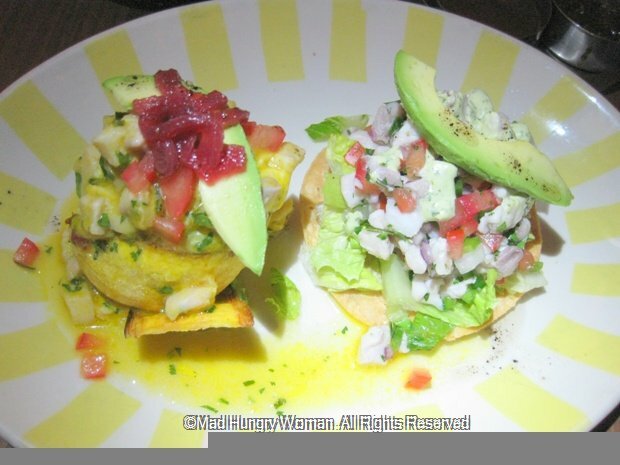 Ceviche Duo ($15) was the perfect thing to whet our appetites. Baja Ceviche consisted of shrimp, lime marinated sustainable seasonal fish, jalapeno tomato and cilantro aioli and had a lovely creamy texture throughout. The Peruvian Ceviche, which I’ve tried at the Cadillac Culinary Challenge is lovely and tart with lime, ginger and aji amarillo chile as seasonings. Watercress, Jicama and Orange ($8.75) was so refreshing. 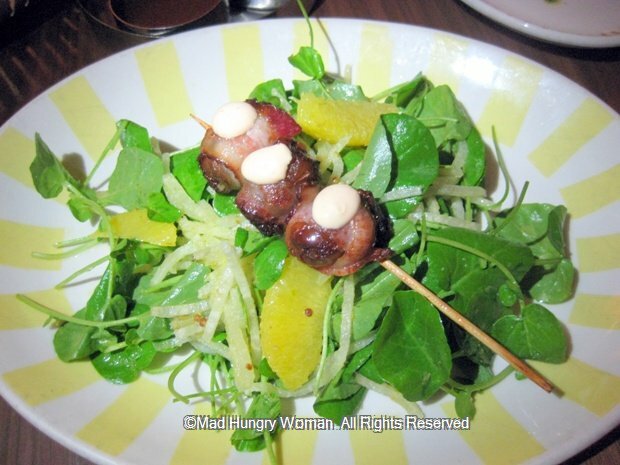 I love watercress salad and used to eat it a lot when I lived in Hawaii, but somehow, not a lot of places here have it on the menu. Together with crunchy jicama and sweet oranges, this salad makes a great light meal with bacon wrapped dates stuffed with chorizo and cabrales blue cheese and tossed in a toasted coriander vinaigrette. 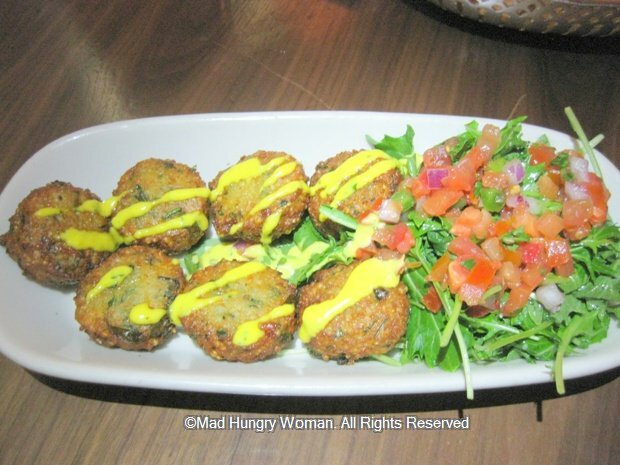 The Quinoa Fritters ($7.50) are a healthy addition especially as an option for vegetarians. Sprinkled with cotija cheese and a drizzle of aji amarillo aioli, it was a little on the dry side. My friend asked for extra aioli and that did the trick. The fritters were so delicious after we slathered more sauce on it. We also sampled the Crispy Potato Rajas Taco which is served on the lunch menu as well as the happy hour menu ($9.75/$3 respectively). Creamy potato and chiles, manchego, panela, cotija cheeses, guacamole, grilled corn relish and a chipotle crema made it a delicious crispy mouthful filled with contrasting textural components. There is an array of desserts on the menu and the best part is the menu offers a selection of desserts in either a two item or three item choice. We got the Dessert Assortment ($9/2 item) — Goat Milk Cajeta Flan with caramel sauce which was very light and not at all like what I expected. The flavors were mild without the strong aromas of goat’s milk. 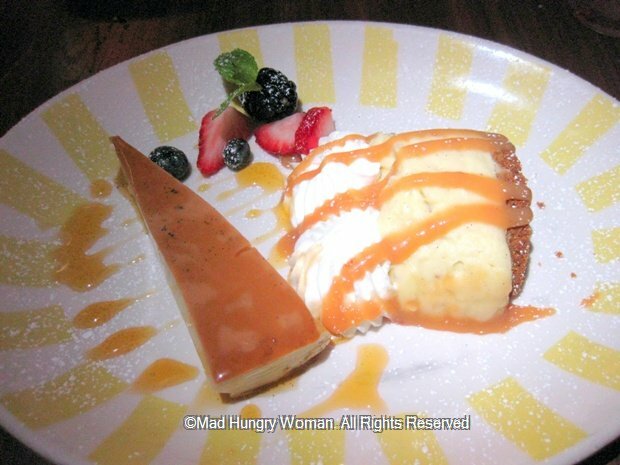 Banana Cream Pie was also mild in flavor. Homemade whipped cream was a great addition as well as the graham cracker crust. 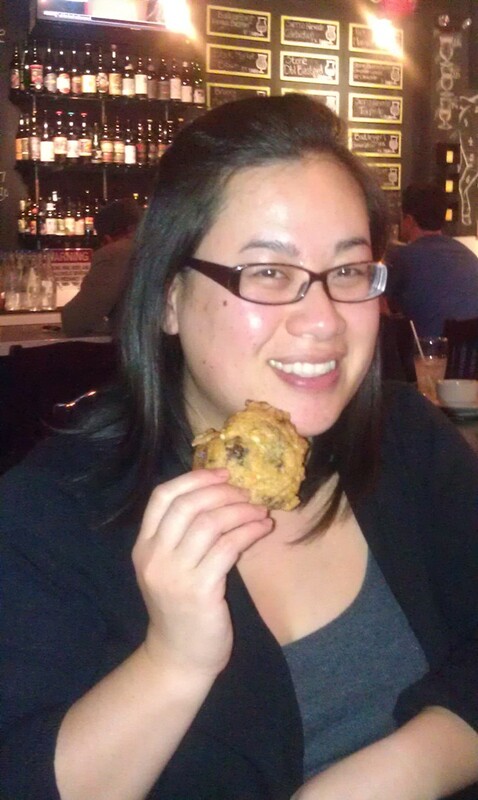 My final cookie recipe from the Chunk N Chip Cookie Challenge is from Grace Nguyen who also happened to be the winner of the competition. Grace is a home baker who started baking in high school and always enjoyed experimental baking. The Chip Chip cookie was created after messing around in the kitchen. 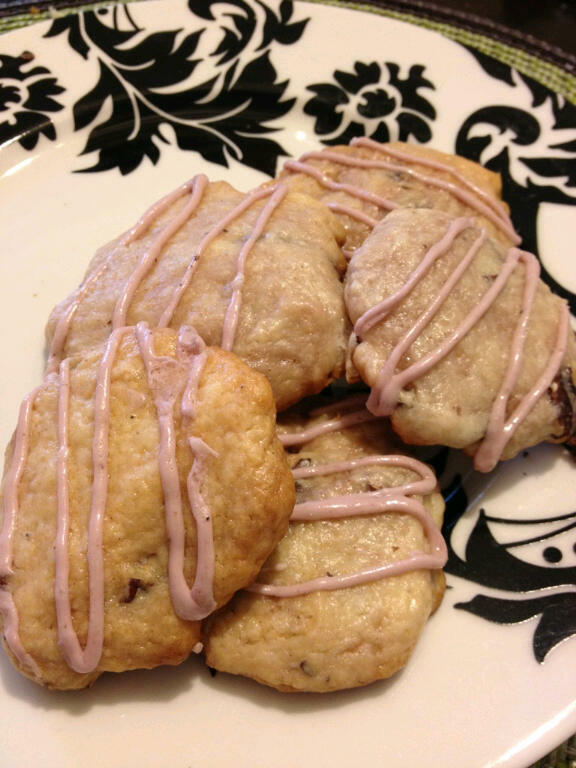 The cookie is extremely popular with her family and friends and is in constant demand. In 2005, Grace went beyond the cookie baking and expanded to cakes. Now she makes elaborate fondant decorated wedding and party cakes and tasty cake balls. This year, Grace started Grace of Cakes, although the business is currently on hold while she looks for a new kitchen, but in the meantime she still bakes for family and friends while she keeps her day job as a high school counselor. When I tasted Grace’s cookie at the challenge I liked how the potato chips added a hint of saltiness to the sweetness. 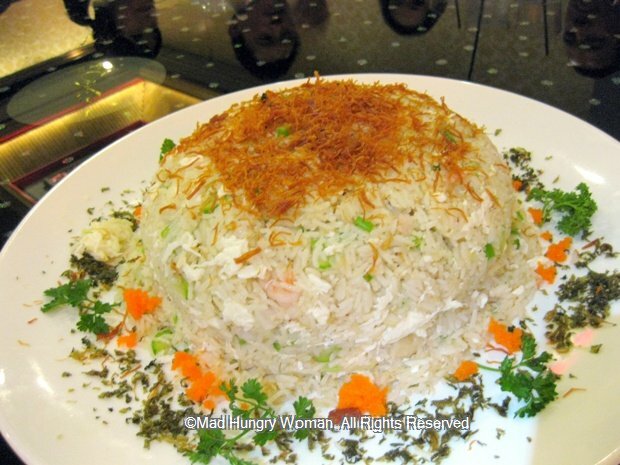 Although she used shredded coconut, I didn’t taste it — which is a good thing — because I am not a fan. Try this recipe out yourself! 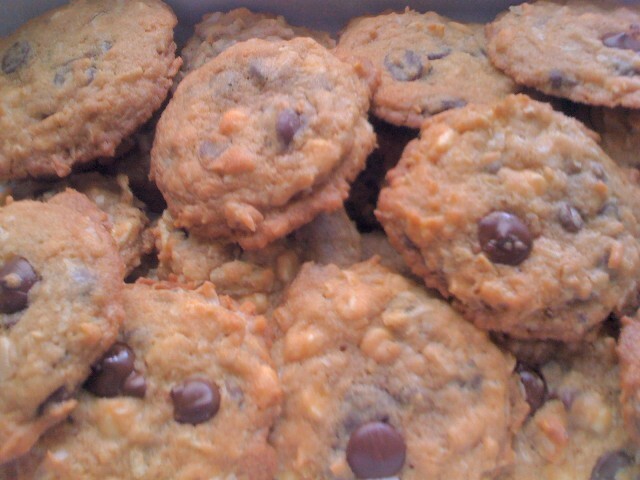 I only used dark chocolate chips because I don’t like white or milk chocolate. Sift flour, baking soda and salt together in bowl and set aside. Mix butter and both sugars until well blended. Add eggs one at a time, then vanilla extract. Once well mixed, slowly add dry mixture to butter mixture and well blended but don’t over-mix. Then add all the chocolate chips, coconut and potato chips and blend with wooden spoon. Drop on a cookie sheet lined with a silpat or parchment paper by the tablespoon and bake for 10-12 minutes until edges are brown. Cool on rack and enjoy. The fourth cookie from the Cookie Challenge is from Ashley Birdzell. Ashley is a mom who was born in California but raised in Texas. 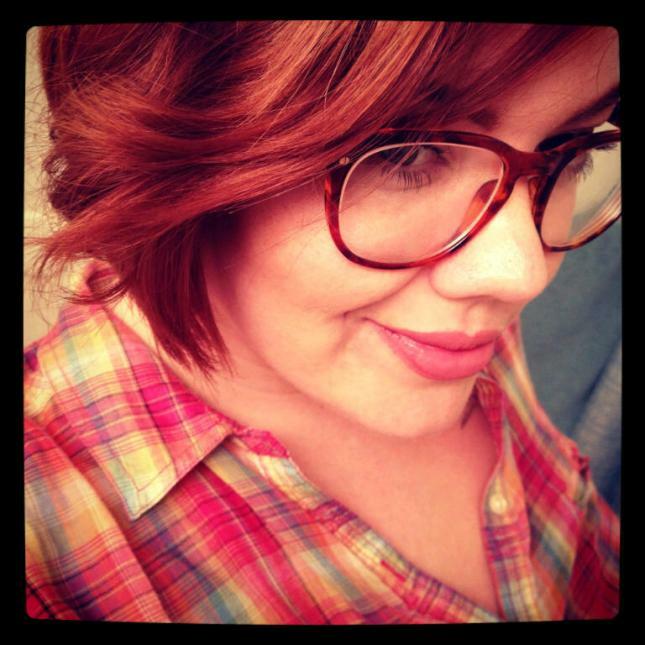 She currently lives in Riverside,CA and learns more about life everyday from her 2 year old who is a ball of energy. Her little kicker is a nod to her Texas family but the raspberry jam is the icing thanks to her California roots. Every Christmas her Uncle Mike here in California makes the best jam and one night she had some left over and decided to put it on top of her cheesecake and she was in heaven! Then I thought it would be fantastic to make a cookie out of it. Her Aunt Mary back in Texas always treated her with cookies and sweet tea when she got home from school so cookies really bring back memories for Ashley. Her recipe for the cookie is below. In a bowl beat Cream Cheese until fluffy and smooth, beat in egg and spices. Mix in cookie mix with spatula, stir in raspberry jam and pecans (optional for nuts). It’s been a year since my last visit to TusCa and in that time, a new chef has settled in with a new menu. Chef Rachid Lahik is handsome and soft-spoken with an impressive resume including time spent at the exclusive Pelican Hill Resort. We started with Cozze al Zafferano ($13), a Mediterranean mussel dish which is reflective of Chef Lahik’s Moroccan heritage. 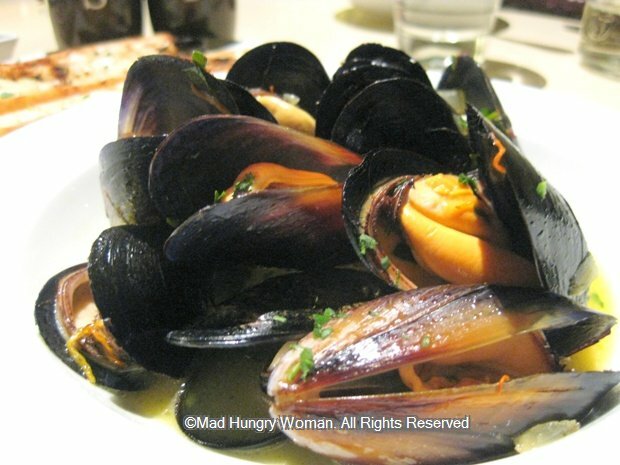 The mussels were so tender swimming in a broth with saffron. I enjoyed the grilled bread served alongside which I eagerly dipped into the broth not wanting to waste a drop of it. 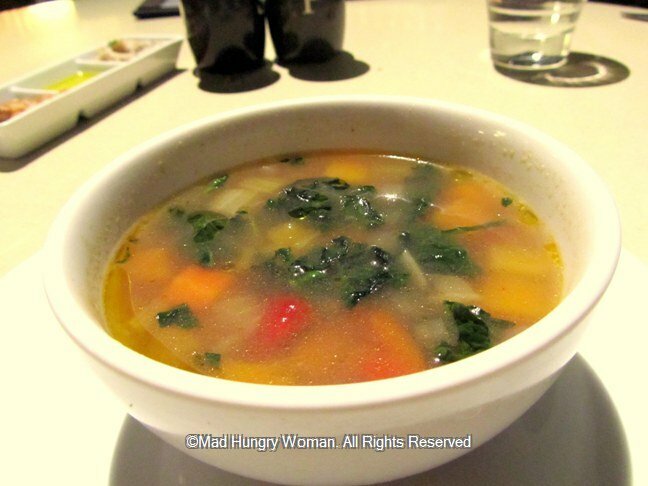 Ribollita ($6), an Autumn vegetable soup is completely vegetarian and was surprisingly flavorful. Whenever I make vegetable soup at home, I use a chicken stock base so I am always impressed when a vegetable soup is 100% vegan. The kale and garbanzo beans were a hearty addition to this very comforting soup. When Chef presented us with Tuscan Pizza ($14), I couldn’t help but smile. 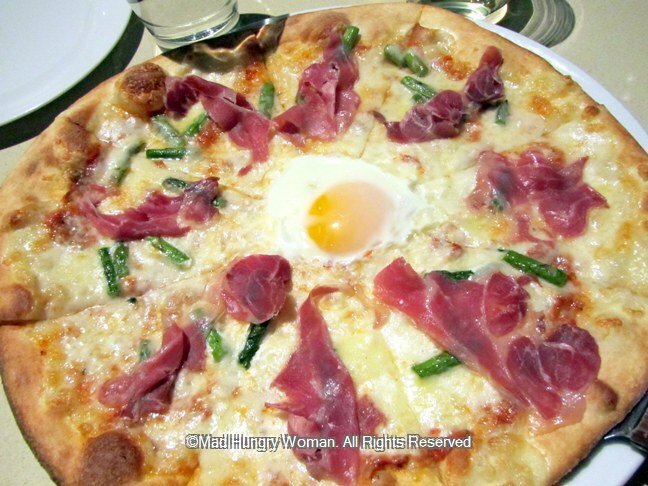 This was the previous Chef Laura’s signature with prosciutto, asparagus, fontina, mozzarella and a whole egg in the middle. It was also my favorite and still remains to be close to my heart. But we weren’t getting away with only one pizza. 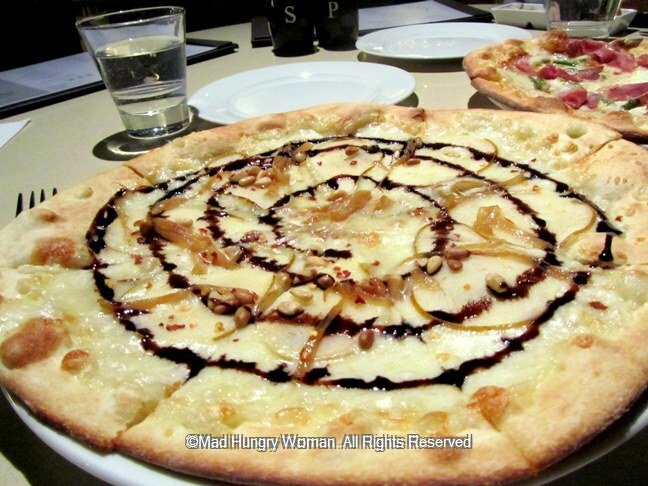 De la Pera Pizza ($14) Is Chef Lahik’s creation with pears, caramelized onions pine nuts, mozzarella, gorgonzola and a balsamic reduction he drizzled table side. This salty sweet pizza is meatless and perfect for vegetarians as well as carnivores. 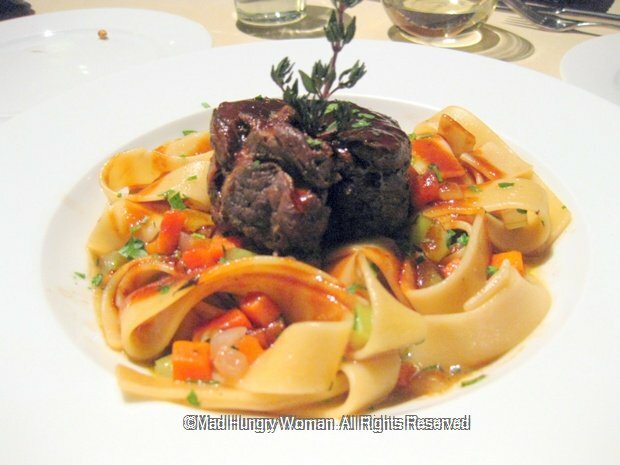 Fall is the season for braising and Pappardelle ($22) features a nice piece of Placido Chianti braised short ribs served on top of pappardelle pasta. Although the following three entrees are presented with their a la carte prices, we actually received a tasting portion of the three, so the photos may not reflect them in their true form. 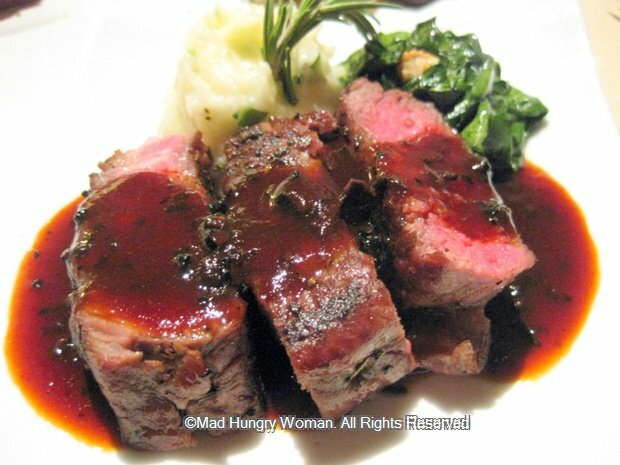 Meat lovers will revel in Bistecca Fiorentina ($34) a perfectly pink rib eye served with rosemary mashed potatoes, sauteed garlic spinach and black truffle sauce. 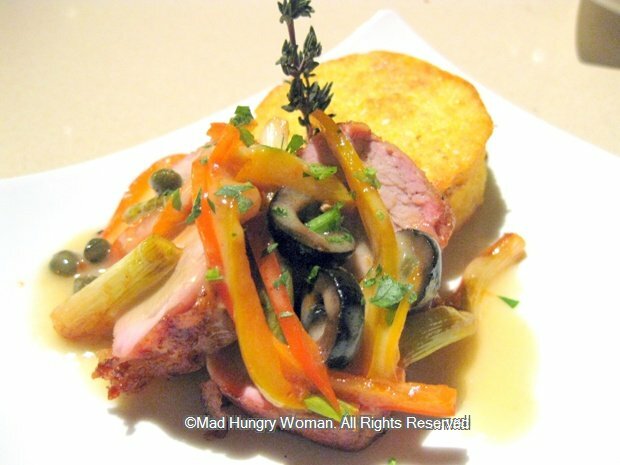 Or, you can try the Tuscan Pork Tenderloin al Peperoni ($22), tender slices of pork topped with flavorful peppers and capers over herbed polenta cake. 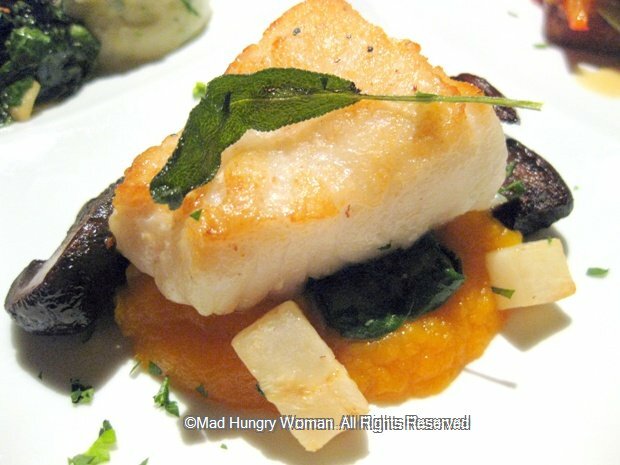 My absolutely favorite of the evening was Pan Seared Chilean Seabass ($28). The fish was melt-in-your-mouth tender and perfectly seasoned. Butternut squash puree, celery root, spinach and porcini mushroom confit accompanied. 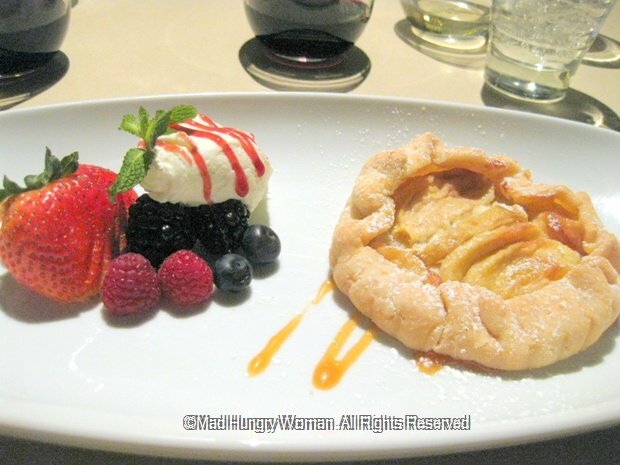 We finished our meal with Warm Apple Tartin with Caramel Sauce ($6) served with marscapone and berry medley. A nice fall dessert which should please everyone. I’ve always been a fan of TusCa’s and am always surprised there aren’t more people in here whenever I’ve visited. The food is stellar, service very attentive, and prices are comparable to other restaurants of this caliber. Complimentary valet parking (up to 3 hours) is available when dining at the restaurant so there should be no reason not to pay them a visit. TusCa has offered a $25 giftcard to one of my readers. For a chance to win, please leave me a comment and tell me what your favorite Italian dish is. You have until Friday, Dec 30th to enter.